Thank you for making National Hug Day great! We’ll see you next year! Q: When is National Hug Day? A: National Hug Day is Tuesday, January 21st, 2020! Stay tuned for exciting updates on how we will celeBEARate at Build-A-Bear Workshop! National Hug Day is a day to celebrate all the heart and happiness a bear hug can bring – and you’re invited to two days of furry festivities at Build-A-Bear Workshop! You can make select furry friends for just $5.50 each with our special in-store National Hug Day offer on Sunday, January 20 and Monday, January 21, 2019. Come feel firsthand how bear hugs come in all shapes and sizes by bringing your own furry friend to life for a BEARY special price. You’ll even be able to wish your furry friend to life on our limited-edition National Hug Day heart – available in stores for a limited time only! Share Hugs with These Adorable Furry Friends for Just $5.50 Each! Lil' Cub Pudding is ready to play! With soft cream-colored fur and brown paw pads, this sweet lil' cub makes a PAWfect friend for anyone. Give big bear hugs with Lil' Cub Walnut! 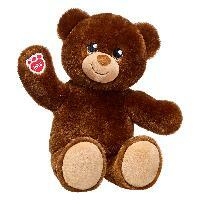 This adorable teddy has super soft brown fur and a warm smile. Dress this cuddly furry friend in your favorite outfits and accessories! Lil' Cub Brownie gives the sweetest hugs! This cute lil' cub has soft brown fur and a smile that brightens the room. Plus, you can personalize Lil' Cub Brownie with outfits, sounds and accessories! Send a Virtual Hug to Anyone This National Hug Day with Our BEARY Special Collection of GIFs! At Build-A-Bear Workshop, we believe that a hug is worth a thousand words. Universally understood and used to express a wide variety of emotions, the simple comfort of a bear hug can say a lot. You can use this one-of-a-kind collection of virtual hug GIFs to send a special hug someone’s way – because everyone can use a good hug! You can use this set of shareable gifs to send as many virtual hugs as you’d like. After all, hugs are just like furry friends – you can never have too many! Earn 1 point for every $1 you spend. Get $10 in rewards for every 100 points. When is National Hug Day 2019? National Hug Day is Monday, January 21, 2019, but we’re having a two-day celeBEARation on Sunday, January 20 and Monday, January 21, 2019. We’ve Extended Our National Hug Day Offer to CeleBEARate! One Day Only! 1/27! When are the National Hug Day offers available at Build-A-Bear Workshop? What are the details of Build-A-Bear’s special offer for National Hug Day? On Jan. 20 and 21 (We’ve Extended Our National Hug Day Offer to CeleBEARate! One Day Only! 1/27), Guests of Build-A-Bear Workshop can make their own Lil’ Cub teddy bear—and make a wish on a colorful, limited-edition heart before placing it inside—for just $5.50 USD/$5.50 CAD/£5.50 GBP/€5.50 IEP/59kr DKK each, in U.S., U.K., Canada, Ireland and Denmark stores! Three cuddly varieties of Lil’ Cub furry friends are included in this special offer: Lil’ Cub Pudding, Lil’ Cub Walnut and Lil’ Cub Brownie. 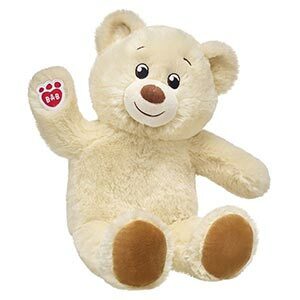 Additionally, select furry friends will also be available at buildabear.com and buildabear.co.uk for $10 USD/$10 CAD/£10 GBP each Jan. 20 and 21. How many $5.50 bears can I purchase? Guests may purchase up to 6 (six) total Lil’ Cubs for $5.50 each. Are there any other limits/exclusions for the deal? Clothing and accessories are sold separately. Must be a Build-A-Bear Bonus Club member to participate. Why is Build-A-Bear celebrating National Hug Day? The hug of a teddy bear is universally understood, and for more than 21 years, Build-A-Bear has been sharing heart and bear hugs with Guests around the world. This year, Build-A-Bear wants to continue sharing hugs, heart and happiness with as many Guests as possible, which is why we are recognizing National Hug Day with a special two-day event in stores, and introducing an inaugural Hug AmBEARsador, Jason Mraz, to help them share the love. Which Workshop locations will be participating in the National Hug Day offer? All Workshop, Concourse, and Outlet locations are participating in the special National Hug Day offer, with the exception of Build-A-Bear Bakeshop and Build-A-Bear Workshop stores located within other shops or restaurants (Landry’s, Great Wolf Lodge, Carnival Cruise Line, Beaches Resorts, Mascot Hall of Fame and Cook Children’s Medical Center), and Build-A-Bear Workshop within other retail stores or restaurants, including but not limited to, Yankee Candle, Rainforest Cafe® and Build-A-Dino® Experience within T-REX Cafe™. What is a Hug AmBEARsador? A Hug AmBEARsador is someone who embodies the Build-A-Bear mission to “add a little more heart to life.” Hug AmBEARsadors are passionate about focusing on what is good in the world and use their platform to share heart, hugs and happiness. 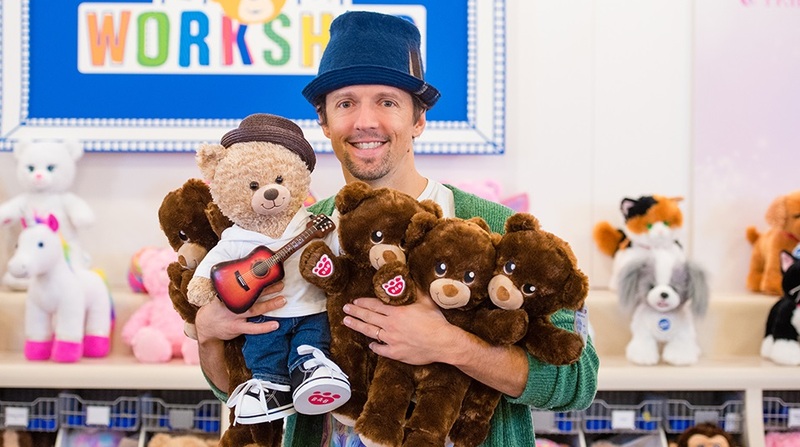 Why did Build-A-Bear choose Jason Mraz for their inaugural Hug AmBEARsador? How much does the Jason Mraz Bear cost? What about the album? The Bear and album will be available as a bundle for $25 USD/$27 CAD/£22 GBP/€23 IEP/229kr DKK each, plus tax, in stores and online. The bear may not be purchased separately; however, the album can be purchased separately online for $6.99 USD/$8 CAD/£6 GBP/€7 IEP/59kr DKK each, plus tax. Do you know who next year’s Hug AmBEARsador will be? 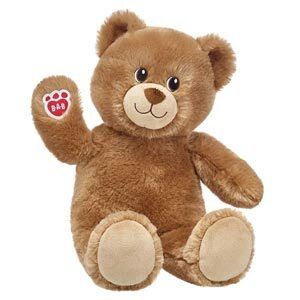 We are excited to announce our first Hug AmBEARsador to celebrate National Hug Day 2019. We do not currently have plans to share regarding our 2020 Hug AmBEARsador; however, we encourage Guests to follow Build-A-Bear on social media for updates and sign up for Build-A-Bear Bonus Club to be among the first to find out about the latest brand news. Meet Our 2019 Hug AmBEARsador! For our National Hug Day 2019 celeBEARation, Build-A-Bear is teaming up with recording artist Jason Mraz to share bear hugs with more people in more places! $5.50 National Hug Day offer valid in stores only January 27, 2019. Offer valid for Build-A-Bear Bonus Club members. Offer valid only on Lil’ Cubs Pudding, Walnut and Brownie. Limit 6 eligible furry friends total per purchase. Price does not include tax. Quantities are limited. Availability may vary by location. Offer not valid on previous purchases and cannot be combined with any other offer. Offer excludes Landry’s, Great Wolf Lodge, Carnival Cruise Line, Beaches Resorts, Mascot Hall of Fame, Cook Children’s Medical Center, and Build-A-Bear Workshop within other retail stores or restaurants, including but not limited to, Yankee Candle, Rainforest Cafe® and Build-A-Dino® Experience within T-REX Cafe™. All products available while supplies last. Outfits and accessories sold separately. Offer valid only at Build-A-Bear Workshop® stores (including Walmart locations) in the United States and Puerto Rico. Prices are in US dollars unless otherwise noted. $5.50 National Hug Day offer valid in stores only January 27, 2019. Offer valid for Build-A-Bear Bonus Club members. Offer valid only on Lil’ Cubs Pudding, Walnut and Brownie. Limit 6 eligible furry friends total per purchase. Price does not include tax. Quantities are limited. Availability may vary by location. Offer not valid on previous purchases and cannot be combined with any other offer. All products available while supplies last. Outfits and accessories sold separately. Offer valid only at Build-A-Bear Workshop® stores in Canada. Prices are in Canadian dollars unless otherwise noted. $10 National Hug Day offer valid online only January 20 and 21, 2019. Offer valid on select furry friends only. Prices do not include tax. Quantities are limited. Offers not valid on previous purchases and cannot be combined with any other offer. All products available while supplies last. Outfits and accessories sold separately. Offer valid only at buildabear.com. Prices are in US dollars unless otherwise noted.